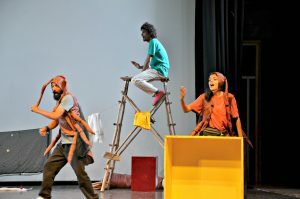 Jaipur’s theatrical production ‘Tilchattey ki Diary’ (Diary of a Cockroach) by Jawahar Kala Kendra (JKK) will be staged in Bangalore and Mysore. The theatrical group is all set to perform two shows at the ‘AHA! International Theatre Festival for Children, 2017’ at Ranga Shankara in Bangalore on 12 July. 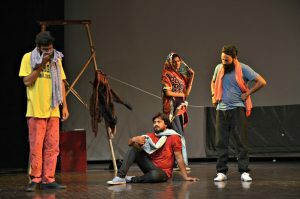 The troupe will also be performing two shows at International Theatre Festival ‘Subbanna Smarane’ at Natana Rangashaale on 14 July in Mysore. The 50-minute long play, directed by Mr. Sukhesh Arora tells the story of how the human and the natural world have to come to collide in a wholly unexpected and cataclysmic fashion. In their desire to control and shape the world to their advantage, human beings have set in motion a series of irreversible events. Revolving around the theme of climate change, the objective of the play is to stimulate the audience to think proactively and come up with workable solutions to real-world problems. The play has grown out of a unique and intense process of collaboration. It is a story without a hero or heroine or a villain. It has two cockroaches, one chicken, a farmer, a young girl and two boys who are both subjects and objects- they act and are acted upon. None of them comes out a winner but all of them are losers to some degree.